Yoga Pose of the Week from Shree Yoga's Genevieve Oswald. Julia Daye Interview: Power Dance, and Movement is Free! The first-annual Paseo was a smash hit. 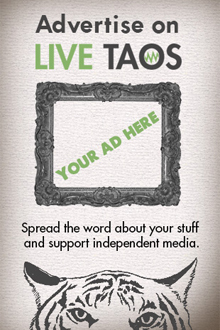 Checking in on what's up with the Taos literary society. Like photography, but with sound.